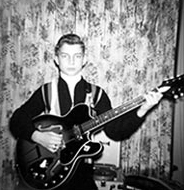 This is a very short chapter touching on the early musical influences that I had, primarily through what my father had performed and listened to, but that also of Elvis Presley and Buddy Holly. 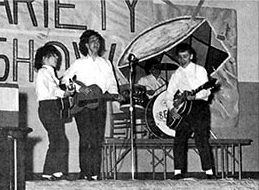 Pantomiming the “Beatles” in February of ’64 at Grafton Junior High School. I’m on the left with the “Regal” guitar.